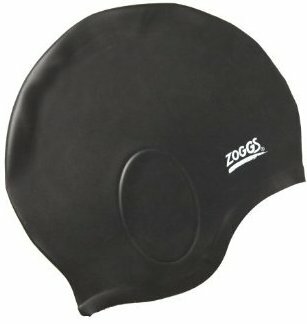 The Aquapro swirl swim cap provides a soft and effective waterdam to protect hair from chlorine, oils, etc. It is constructed of the finest quality, durable rubber. Chin strap is adjustable. White with a raised swirl pattern for a great vintage style. 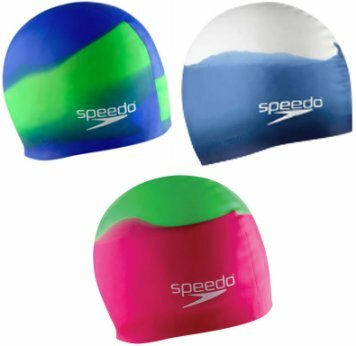 Speedo's bubble swin cap is great for aqua fitness. Provides optimum comfort and UV Protection. Redesigned bubble cap is lightweight and flexible. 3D sculpted design does not pull hair. 100% Silicone for extra comfort. 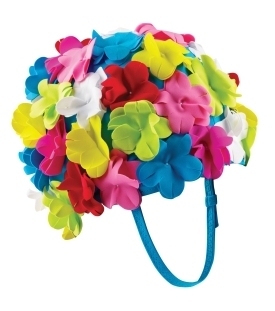 Stand out in this bright, retro looking swim cap with multi-color 3D flowers. Lightweight and breathable fabric offers optimum comfort. Adjustable chin strap for secure fit. 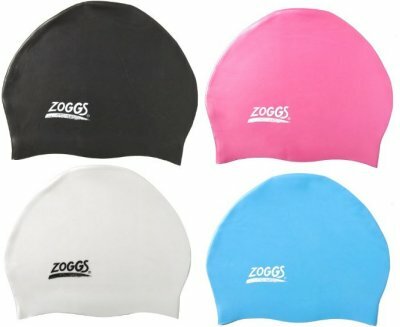 Whether you're out to prowl the local water hole or charge through a swimming session in style, these adventurous caps are just the thing! 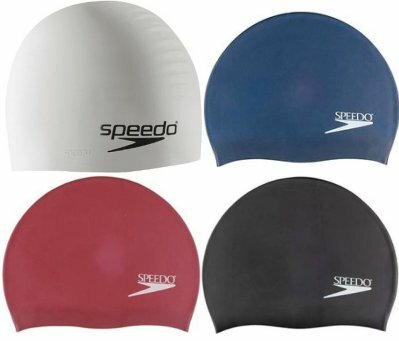 The Silicone Stretch Fit Cap from Speedo is great for recreational swimming. Specially designed not to pull hair. Elastic band at base for secure comfortable fit. 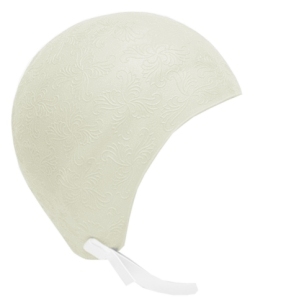 Unique dome shape allows for use with long hair. Outer lining silicone, inner lining polyester/spandex. Available in size S/M (head circumference above brow 20 inches) or X/XL (21 inches). Available in black/silver stripe; silver with black stitching; silver with purple stitching, black, navy/silver stripe or pink/silver stripe. 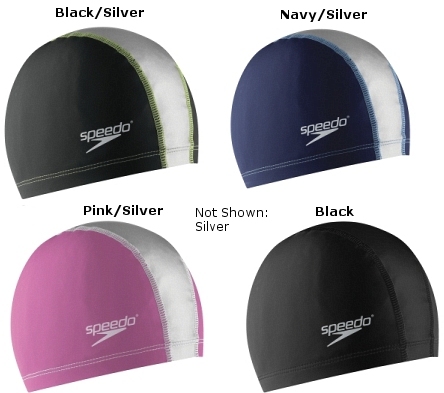 Lightweight and durable cap that is designed to hold dome shape and rounded fit with no wrinkles, which reduces drag. The silicone allows the head to breathe for a more comfortable fit and can be stretched to more than double its original size. Quick and easy to take on and off without snagging hair. 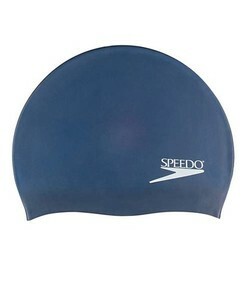 The cap of choice for Olympic champions. Lightweight silicone provides durable performance and optimum fit. Easy on and off design won't snag hair. 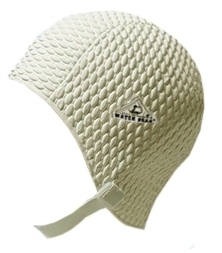 Relive a blast from the past with this bubble swim cap from Water Gear. Features a heavy weight rubber construction, durable anti-tear edge and adjustable chin strap. Comes in white (slightly cream colored) in sizes small, medium and large.